Bold drama surrounds the setting created by Heather Lenkin. Furniture and accessories Baker, Knapp and Tubbs. 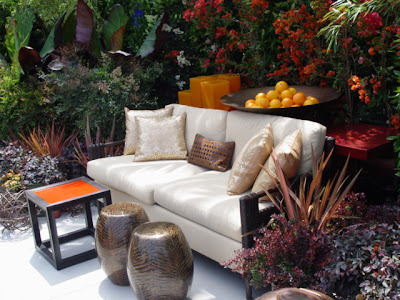 Plant material from Lenkin Design and Monrovia Growers. I found you on Blotanical and came over to read awhile. I didn't expect such a slick professional web site. I started at the top and read down to here. Out of time, now, but I am sure I will be back. The projects and photos are beautiful!